Generally I don't find spending time researching politics and politicians all that much fun. So when I had a look at my Slania collection to see which Iceland stamps were next on my blog list, I wasn't exactly enthusiastic about the subject matter - a president! Especially in the current political climate where all we seem to hear about are the controversial actions of a certain country's leader! But then I had a bit of a read about the subject of this blog and I found the man in question to be rather interesting! Kristján Eldjarn, born 6 December 1916, was Iceland's third president. But he wasn't always into politics. That came somewhat later. His passion was actually archaeology, which he studied at the University of Copenhagen. After working in several teaching positions he became a curator at the National Museum of Iceland in 1945. And just two years later in 1947 he became the museum's Director. While in this position he furthered his studies in archaeology and earned his doctorate in 1957 for his research into pagan burials in Iceland. Then in 1966 he became the host of an educational television series on RUV (Icelandic National Television). In this series he introduced the audience to some of the artifacts housed in the museum and he discussed their historical importance. This show became very popular. Kristján Eldjarn became a well-loved household name. It was perhaps his newfound popularity that prompted him to run for president in 1968 as a 'politically non-affiliated candidate' (Wiki). 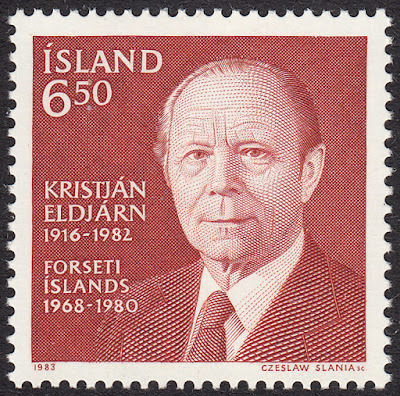 Kristján Eldjarn won the election and became president in 1968. It is perhaps indicative of his popularity that he ran unopposed in the next two elections in 1972 and 1976. In 1980 he chose to resign from politics and return to his passion of archaeology. Sadly, he died two years later in 1982. 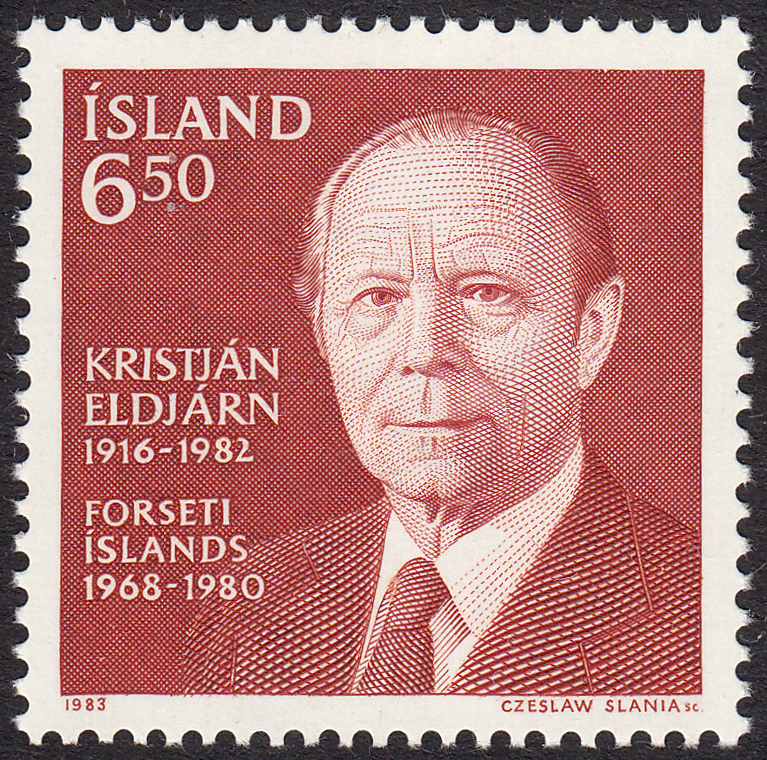 On 6 December 1983 Iceland issued a set of two stamps commemorating the life of their much-loved president, Kristján Eldjarn. The issue consisted of one design issued in two values. 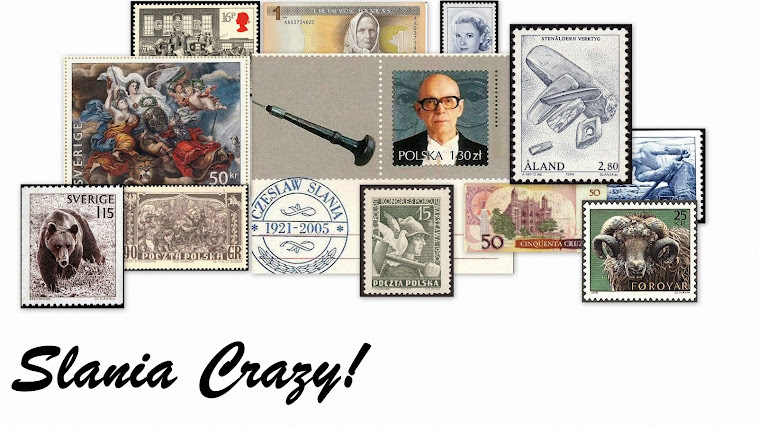 The design of this very important commemorative was entrusted to Czeslaw Slania. Not surprisingly, Slania's work produced exquisite results. What Slania has produced here is the portrait of an intelligent and caring man, who, despite his great leadership, was just another human-being with frailties like the rest of us. A superb engraving! Sweden 1964 Test stamp and 1967 issued stamp.